WEATHER: Clear sky to start, cloudy mid-morning, clear again later. Warm at times. Another superb start to the day, our pre-breakfast walk down to the river proved popular but no new sightings we made. We saw a family party of Dippers on the rocks in the swollen river and a Grey Wagtail. The usual woodland and garden species were found along the lane, we still haven’t seen a Song Thrush although we hear them all the time. We intended to look for more alpine species today by driving up to the high pass at Belagua, our route took us from the Hecho Valley into the Anso Valley and then the Roncal Valley before rising up over the mountains at Belagua. The glorious sunshine magnified the beauty of the mountains it was just stunning, each valley had its own geological characteristics and eye-catching rock formations. 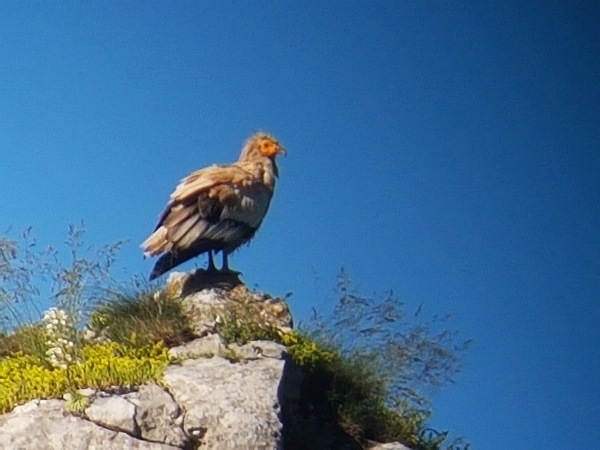 We stopped on a ridge between the Hecho and Anso Valleys to look for raptors, in fifteen minutes we saw several Egyptian Vultures a couple of distant Griffon Vultures and a Red Kite. On an arch rock face at the entrance to the Anso Valley we searched for Rock Bunting and Blue Rock Thrush but found only a single Egyptian Vulture and some Crag Martins. Once in the Anso Valley we stopped to scan another rock-face and found only vultures and a few Carrion Crows. Making our way up the valley through the village of Anso and onto Zorita we passed through some stunning scenery, a narrow gorge along a river was superb. At Zorita the gorge opened out to wide open valley, we parked up and scanned the skyline and mountainside for anything that moved, which wasn’t much. 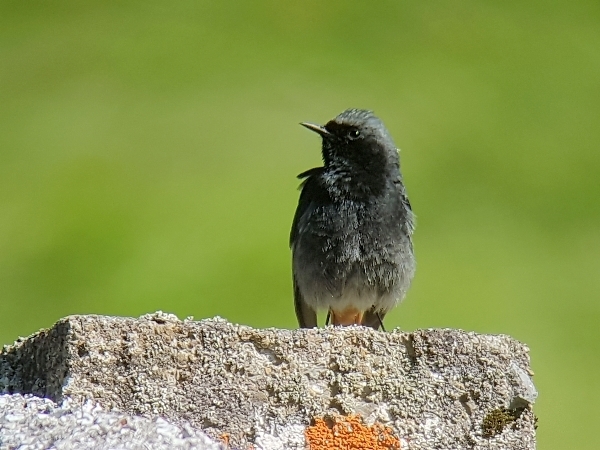 Black Redstarts, a Yellowhammer, Linnets, Crag Martins and White Wagtails was all we saw. The link road between the Anso and the Roncal Valleys opens out with a wide flat bottom and wooded mountainside on both sides, a great place for Black Woodpeckers, we saw none and didn’t even hear one! Once in the Roncal Valley we could see that the high pass was covered in clouds, not a good sign. It was cold and wet up there when we arrived. For an hour or so we stopped in several places seeing very little through thick misty clouds. Dunncok, Alpine Chough, a few Linnets and not much else. For the next hour we drove down into France to the Foret D’issaux, a forest famous for its woodpeckers. However the misty. Wet, cloud was still with us and we never saw a bean. We ate our picnic lunch standing around the bus and quickly left the area. 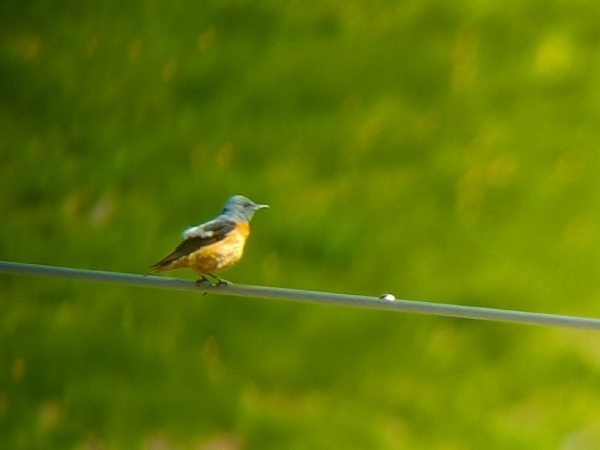 We re-entered Spain at border near Astun so we drove towards Astun Ski Village to look for Rock Thrush. The cloud base lifted and breaks in the cloud were now visible, the sun even came out again. Over the next hour we walked along the approach road to Astun and finally we found a pair of ROCK THRUSHES. 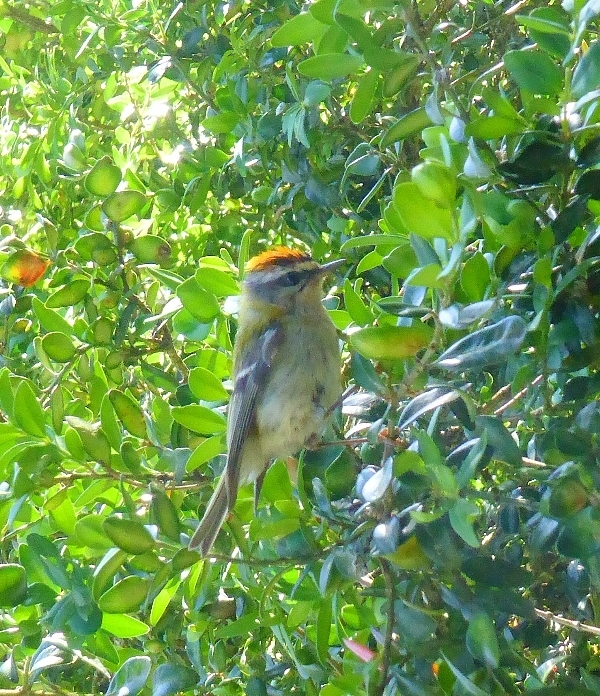 With a little patience we had great views, especially of the male, marvellous, it was well worth waiting for. Other birds seen were Dipper, Northern Wheatear, Water Pipit, Linnet, Black Redstart and Short-toed Eagle. Our drive home took just over an hour and by 7:30pm we were washed, changed and ready for the bird-log which was very short today. Dinner was served at 8pm and by 9pm we were all out in the car park ready for our ‘Owl-prowl’, this involved a 30 minute drive towards Jaca and then parking on a side road near a wooded ridge. 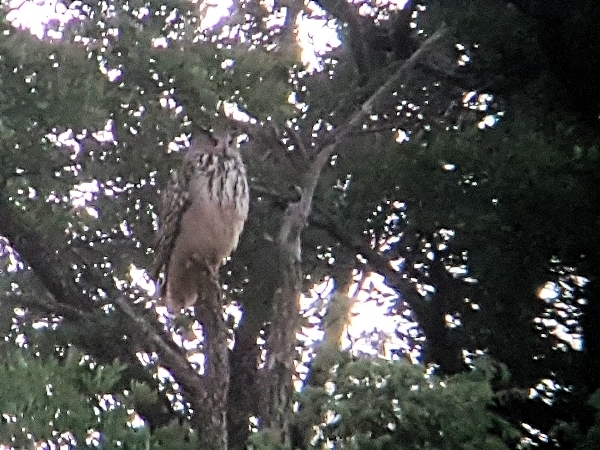 About 10pm, in the twilight zone, we found an EAGLE OWL perched on a dead tree in the wooded hillside, we all had marvellous views of it in the scope, the evening light was so clear. We saw it fly off some 15 minutes later. We then waited for another 15 minutes hope for a nightjar or a Scops Owl to call but neither did, so we drove back to hotel arriving at 11pm.